The Yantrodharaka Hanuman Stotra is a short composition dedicated to Hanuman, which was composed by a sage called Vyasaraja during the Middle Ages. Many devote Hanuman Bhakts, especially those from the southern part of India regularly chant this Hanuman Stotra like a Mantra for their general well-being. This Hanuman Stotra Sadhana is also said to bestow immense strength and powers to the Hanuman Bhakt, including the Shakti to remove the obstacles and diseases of others who facing problems or pain. The Sadhaka should install a Murti of Hanuman holding the Gada[Mace] in one hand and the other hand in Varadahasta Mudra[ meaing a hand which is blessing or bestowing boons to the devotees]. The Hanuman Bhakt should perform Shodashopachara Puja of the Murti [the Sixteen Steps Hindu ritual of worshipping deities]. The Sadhaka should then offer Panchakhadya to the Hanuman Murti. Panchakhadya means the offering a 5 ingredients Bhog to the idol, for example a offering of a mixture of dry Coconut Pieces, Almonds, Dried dates, Cardamom Powder and Powdered Sugar. Then the Sadhak should recite the Yantrodharaka Hanuman Stotra 108 times. The Shastra says that the completion of 108,000 Stotra recitations is needed to gain the immense benefits mentioned above. Apart from this Hanuman is said to give Swapna Darshan [Vision in a Dream] to the devotee. On the completion of the prescribed number of recitation of the Yantrodharaka Hanuman Stotra, the Sadhak should perform Brahman Bhojan of 11 Brahmans and give them some gift as per his financial position. Note- a Yantrodharaka Hanuman Mandir is located in the ruins of Hampi in the State of Karnataka, it was the Headquarters of Vijayanagara Empire. 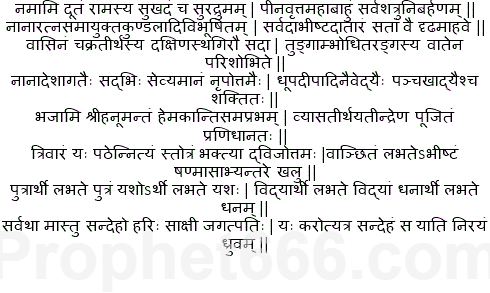 The devotee can recite the Yantrodharaka Hanuman Stotra in any language, it is commonly available in many languages including Hindi, Sanskrit, Marathi, Tamil and Kannada. The benefits of this stotra as you have said blesses the sadhaka with immense strength.But do you have a seperate Hanuman Mantra that promises immense Strength to the hanuman bhakt? Yes Sir.I have seen and chanted that mantra. In one of your post,I have also shared you one 'Hanuman Mantra for Extreme Strength and Power' That is also very effective. This Hanuman Stotra as mentioned in the post in easily available in English and many other languages. which day would be ideal to start the mantra?